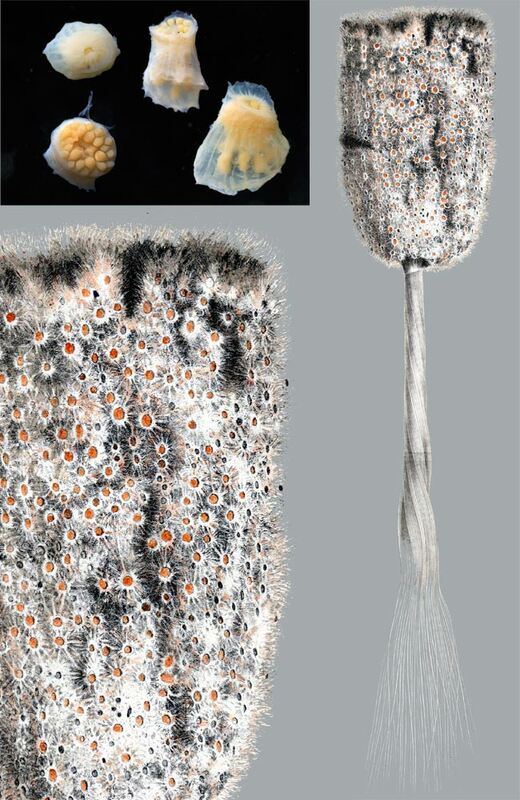 This very interesting and in some respects unique species lives symbiotically within cups of glass sponges Hyalonema sieboldi collected in Sagami Bay (Japan) at depth of about 500m . We described it in 2012 as a new species, new genus and erected a new family Spongiactinidae for it. Unfortunately we have no photos of living specimens, the picture reproduced here shows our photo of several preserved specimens and a drawing from old monograph of Schulze (published in 1860) who was first who mentioned these anemones in the body of the sponge (but not applied any scientific name for them - so actually the species remained undescribed and not known to zoologists) and who showed them as numerous small red-orange dots in the caves of the dermal surface of H. sieboldi. Here is our publication describing this species and a new family Spongiactinidae: Sanamyan, N.P., K.E. Sanamyan, K.R. Tabachnick, 2012. The first species of Actiniaria, Spongiactis japonica gen.n., sp.n. (Cnidaria: Anthozoa) an obligate symbiont of a glass sponge. Invertebrate Zoology, 9(2): 127-141.